If my real email address is [email protected] or [email protected], I want my WordPress emails “branded” with my real email address. 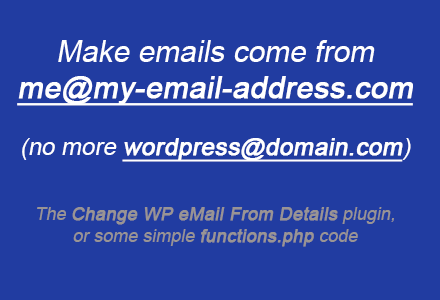 The Change WP eMail From Details plugin is quick and easy to setup and does exactly what we want. See the end of this post for a simple functions.php alternative, which is my preferred method because the Change WP eMail plugin isn’t from the WP Plugin Directory, and there are more files in the plugin’s folder than I would have expected necessary to achieve this functionality, plus some warnings from the Plugin Check plugin. I did verify both methods accomplish the stated goal – to customize the “from” email name and address. Notice the check boxes; they control the plugin’s operation. To be clear, the General Settings email address is used for receiving administrator emails, not the setting for outgoing emails. This is something you’d probably want out of your theme’s functions.php file and into a “functions plugin”. The code is the same, but use the plugin mentioned above (without these snippets), or use a functions plugin instead of your theme’s functions.php file. I like this one because it’s easier to add to new websites. I don’t want to accidentally use “[email protected]” and then copy/paste to my client at xyz.com and have their emails look like they’re coming from lmnop.com’s site. If you put “[email protected]” in this code, it’s basically duplicating what WordPress already does by default. So maybe use “[email protected]” and make sure that’s an address that your users can reply to. Or use “[email protected]” to discourage reply emails. Your email recipients (like new member registrations and post edit notifications) will see your plugin’s settings in action. It’s as simple as that. Feel free to share your own experiences below.